The reproductive cycle begins when the virus uses its tail fibres to attach itself to its victim (1). The details of what happens next vary according to the different phage types. But their aim is always the same: to get their genetic material, which is located in the head, inside the bacterium. T4, a well-studied phage infecting the Escherica coli bacterium, then contracts its tail sheath which pushes a tube located within the tail through the membrane of the bacterial cell (2). 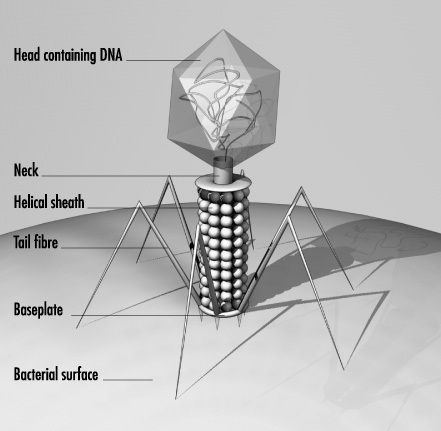 The phage’s DNA is passed through the tube into the cell, where it takes control, brutally stops many of its vital functions and forces it to churn out new virus components – heads, tails, tail fibres – in production-line style (3). Then comes the final assembly. 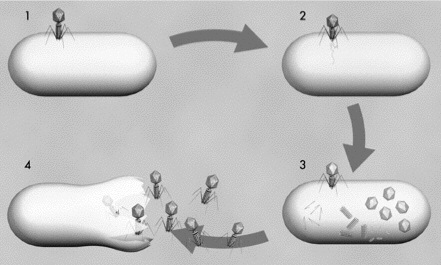 Finally, enzymes dissolve the wall of the bacterium from the inside and the newborn bacteriophages reach the exterior, ready to attack new victims (4). The viruses proceed very selectively as they do so. 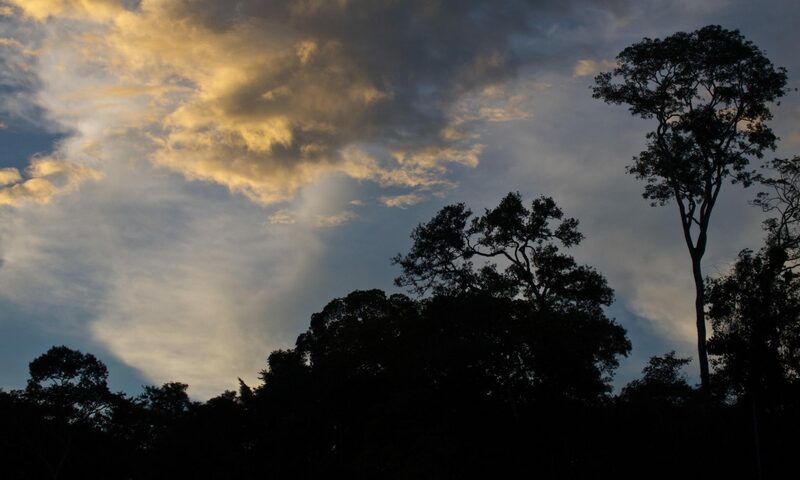 Most of them attack only a subgroup of a single bacterial species. Generally, they don’t touch animal or human cells, which is why they are harmless to human beings.